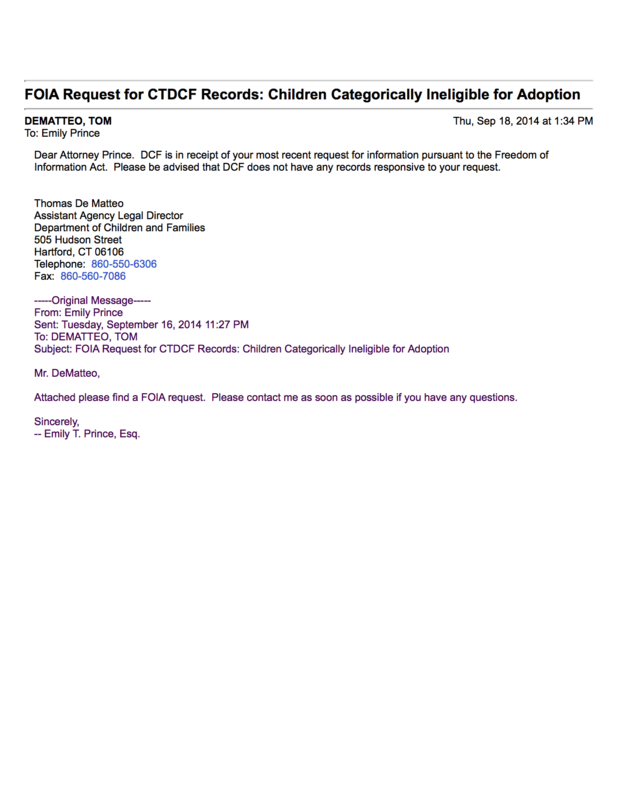 In response to a recent FOIA request for processes, eligibility criteria or other methods for determining no adoptive parents would be permitted to adopt a specific child, Connecticut’s Department of Children and Families admitted yesterday afternoon that it had no documents responsive to the question, meaning no such policy exists. That raises the question: if there’s no policy allowing CTDCF to turn away all prospective adoptive parents, on what basis are they doing exactly that when it comes to Jane Doe? This new response again demonstrates that CTDCF is ignoring the rights of Jane Doe and is acting outside of the law to keep her imprisoned in a facility for male juvenile delinquents despite the fact that she is neither accused of nor convicted of any crime. This entry was posted in Analysis, Confinement, Freedom of Information Act and tagged CTDCF, Justice for Jane on September 19, 2014 by emily.